Passengers on the brand-new high-speed Fuxing train - whose name literally means renaissance - which has started running between Beijing and Shanghai took to social media to rave about their experience. The Fuxings are the latest "China Standard" bullet trains, completely designed and manufactured in China, capable of running at 400 kilometers per hour. But their speed is capped at a mere 300 kilometers, as is the speed of the older trains on the line, which has disappointed many. These restrictions were implemented after the 2011 Wenzhou bullet train crash killed 40 and injured around 200, following a nationwide chorus of safety concerns. Several political advisers have proposed increasing the speeds in recent years, but in vain. However some believe that the caps may be lifted for the Fuxings. "I'm sure the Beijing-Shanghai high-speed rail line speed limit will be raised to 350 kilometers soon," Sun Zhang, a railway expert and professor at Shanghai's Tongji University, told the Global Times. "The Fuxing series will gradually replace the Hexie (harmony) bullet trains when they retire after an around 30-year life span." However, the major significance of the Fuxings lies not in their speed, but in their standardization, Sun noted. "It's a landmark of the change from mix-blood to pureblood, and it will be no longer controversial for China to export our technology," Ji commented to the Global Times. China first got HSR on April 18, 2007 when the country started running Hexie trains — based on Japanese, German and French technology — on upgraded rail lines at up to 250 kilometers per hour. Based on technologies purchased and absorbed from foreign countries, China rapidly expanded its HSR network and was soon competing for projects abroad. However, the fatal Wenzhou crash put a sudden brake on progress. The incident, caused by a signal failure after a lightning strike, ignited a backlash against HSR. Investment and expansion across the country was virtually suspended. "Construction of many railways was affected. Some projects were interrupted due to a lack of funds, some were postponed. The government also stopped approving new projects. The situation lasted about two years," recalled Li Bo, an employee of a survey and design institute affiliated with the China Railway Construction Corporation in Wuhan, Central China's Hubei Province. "Our workloads dropped sharply. There was only one survey and design project for a coal-fired railway in the whole year," Li told the Global Times. China's efforts to build railways abroad were also affected. "I don't rule out the idea that some Western rivals magnified the incident, fanned the flames and smeared Chinese technologies," Mei Xinyu, an associate researcher at the Chinese Academy of International Trade and Economic Cooperation, told the Global Times. The change in China's top leadership in 2012 turned the tide. The new leaders supported HSR at home and promoted it overseas. In July 2015, Chinese President Xi Jinping inspected Changchun Railway Vehicles Co., Ltd, a subsidiary of China's biggest train-maker the CRRC Corporation Limited (CRRC), and remarked that high speed trains are a "name card" for China. Chinese Premier Li Keqiang has even been nicknamed "the salesman of Chinese HSR" for his continual promotion efforts at international events and on visits abroad. Under the slogan of "bringing in advanced technology and creating China's brand," researchers and developers have created the Fuxing, also known as the China standard electricity multiple unit (EMU). Among all the 254 key standards used in the train, 84 percent are Chinese. Its core technologies, including its power supply, operation management and security monitoring, are all homegrown. 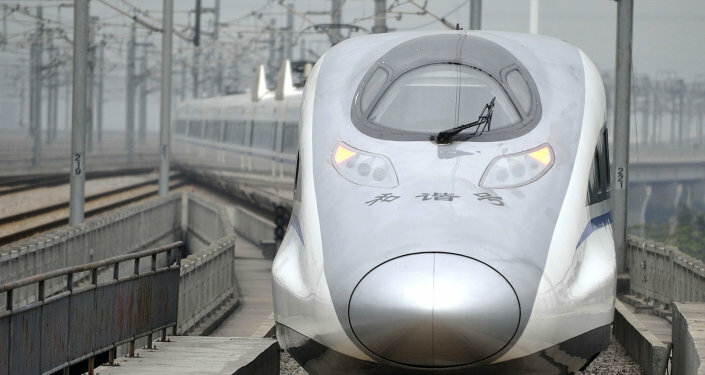 "The standardization will greatly facilitate the production and maintenance of high-speed trains in China," Sun said. This marks a shift from the Hexie series, which used a variety of different standards in different trains under the Hexie name as the technologies used in their construction were borrowed from different countries. Besides their attractive appearance, the stability, noise control, energy efficiency and traction power of the Fuxing series are all superior to their predecessors, according to the People's Railway Daily. The introduction of the Fuxings has also smoothed the road for China to export its HSR technologies and greatly enhanced Chinese discourse power, Ji noted. "In our previous HSR projects overseas, such as the railway we built in Turkey, we had to use European standards and had little discourse power," Ji said. An HSR line linking Turkey's capital Ankara and its most populous city of Istanbul, built jointly by a Chinese-Turkish consortium, was completed in 2014. In the past, patent and safety issues had always been negotiation problems when Chinese groups vied for HSR projects with other major players in the sector. However the patent issue will no longer be a sticking point as the Fuxing series is more or less totally homegrown. "We have invited top US law firms to make an intellectual property assessment of our standard EMU trains, which concluded that our technology will have no intellectual property disputes when it is exported to other countries," Sun explained. Mei believes that the Fuxing trains also show that China has completely walked out of the shadow cast by the Wenzhou crash. "The safe operation of the HSR network in recent years has proved Chinese technologies to the world and restored people's confidence," he said. Sun believes that the Wenzhou tragedy offered China an opportunity to readjust its HSR development plan, making key overhauls and corrections. The railway construction drive has totally revived, Li Bo sharing that the workload at his firm last year was quadruple what it was in 2010. Within 10 years, China, a newcomer to this sector, has become home to the longest and busiest HSR system in the world; by the end of last year, there were 22,000 kilometers of HSR lines in China, over 60 percent of the world's total. The country plans to double the length of HSR lines in service by 2030 and link nearly all its cities that are home to over half a million people. This rise in confidence domestically is being mirrored by a rise overseas, as China steps up its efforts to share its HSR achievements. In 2015, China North Railway and China South Railway, the country's top two high-speed rail firms, merged to form CRRC, so as to be better capable to compete with heavy hitters like Germany's Siemens, France's Alstom, or Canada's Bombardier. According to World Bank estimates, Chinese HSR construction costs, on average, were just two thirds of Europe's and less than half of the US's. But despite advantages in pricing and efficiency, Chinese companies have not had much luck in contracting foreign HSR projects. "There is no case of China exporting high-speed rail that can be described as very successful. The situation is very undesirable," Dou Xin, CRRC Qingdao Sifang spokeswoman, was quoted as saying by the South China Morning Post in April. "The biggest obstacle for countries that have signed deals with China is the lack of financial strength. High-speed railways and bullet trains are unimaginably expensive," said Dou. Sun believes the political turbulence of some recipient countries and political suspicion has also hindered HSR exports. "Some may think that Beijing is trying to expand and penetrate by building HSR overseas, some even speculate that the trains might be used to deliver arms, which is all groundless," he noted. The US private firm XpressWest unilaterally announced in September the termination of its cooperation with a Chinese consortium on an HSR project between Las Vegas and California. "Our biggest challenge continues to be the Federal Government's requirement that high-speed trains must be manufactured in the US," Tony Marnell, CEO of XpressWest, said in a statement. Some Chinese observers have cast doubt on this explanation, pointing out that CRRC already has a factory in the US that produces subway trains. The Pan-Asia Railway Network proposed by ASEAN nations which would link China's Yunnan Province to Singapore via Laos, Thailand, and Malaysia in the middle, Vietnam and Cambodia in the east, and Myanmar in the west, came one step closer to becoming a reality last week when the Thai cabinet approved the Chinese-built Bangkok-Nakhon Ratchasima HSR project. "Countries like Laos and Myanmar all welcome Chinese technologies, but Singapore didn't. It seems that they choose to stand with US and Japan and prefer their technologies," Sun said. China is using high-speed railways as "pieces" to play chess and attempts to "leverage the geopolitical landscape," Ma Liang, a research fellow at the Nanyang Centre for Public Administration at Nanyang Technological University, cautioned in an opinion piece published in the Singapore-based newspaper Lianhe Zaobao in July 2014. Ji says this is misguided. "Via expanding HSRs to other countries and increasing connections, China is willing to share the fruits of its opening-up and reform to the world," Ji argued. Conversely, some Chinese are skeptical of the country's HSR trade pattern, under which the country provides not only technology but also favorable loans. But Mei stated that overseas HSR investment is only made after a careful consideration of the destination's political situation, growth, population and profitability. "China is exporting HSR technologies, not giving them away," he said. There is a strategic need for China to export HSR, Ji said. "The driving force HSR development has on the manufacturing industry is remarkable. HSR exports will also help lead other industries to the world market," he explained. This article was written by Huang Jingjing and first published in the Global Times.